The CUSTOM 45R provides the famous Marshall JTM45 tone with a few key features added. The additional features add a lot of versatility to the classic amplifier. Perfectly complimenting the JTM 45's tone, is the built in tube driven spring reverb effect. The CUSTOM 45R is both a 45 watt and 22 watt amplifier with the optional Hi/Low B+ voltage switch. The PPI-Master Volume control, allows further control of the distortion and overall volume level. Additional tone adjustments includes; the "Bright" switch on one channel and a "Bite" switch, that adds a bit more mid-gain to both channels. The CUSTOM 45R is available in both head and combo versions. Starting with a great foundation, we modeled the CUSTOM 45R's tone after our in house, original, mid-sixties Marshall JTM45 equipped with KT66 (6L6GC) power amp tubes. The CUSTOM 45R is handwired, using our custom handcrafted turret board. In addition to the carefully tuned circuit, critical components such as; reissue Mustard style capacitors, vintage spec'd resistors and custom wound transformers, ensures the awesome tone of the original JTM 45 is obtained. The impedance of our custom wound output transformer is designed around a pair of KT66 (6L6GC) power amp tubes. These features add versatility to the amplifier, while not being intrusive to the original circuit design or tone. The built in tube driven spring reverb effect is a standard feature. Reverb adds a whole new dimension to the tone. As you know, there is nothing like adding lush, natural reverb into the mix. Some people find the JTM's bright channel to be "too" bright, especially for single coil pickups. We have added a bright "cut" switch, allowing you to cut some of the brightness, while still being brighter than the dark channel. The bite switch adds subtle gain to the "mids". Comes in handy when a just bit more gain is required. You can select head, 1x12, 2x10 or 2x12 combo cabinet configurations. 120 VAC. Other voltages available. The Custom 45R provides a great clean tone, a sweet grinding blues tone and an awesome, bighting-overdriven tone. We have made a classic amplifier even more versatile by adding a few key features, all while maintaining the awesome original tone. Like the original JTM, the Custom 45R circuit has design lineage to the original 1959 Fender tweed Bassman. Therefore, the 45R can produce tones from Bassman to cranked up Marshall, all in one box. We feel that you will agree, as many of our customers do; the versatile CUSTOM 45R is perfect for is perfect for a wide spectrum of tones; from jazz, grinding blues, classic rock and modern rock. For those who do not require the built in Reverb effect, we offer all of the above features in our PLX Amplifier Series. ARACOM Amplfiers is a "Custom Shop", therefore we can assist you in personalizing your amplifier. Tolex Color Options: The standard tolex colors for Head and Combos - Black Levant tolex. However, we offer many styles and colors of tolex. Please contact us for details and pricing. Channel switching with remote foot switch. NOS Options: For those who prefer original components as compared to reissue, we offer NOS Phillips/Mullard Mustard capacitors and NOS or tested new Old Stock pre-amp and power amp tubes. Speaker Options: We carry Jensen, Celestion, Eminence and Weber speakers. Please contact us for speaker options. Vinyl covers are available for the Evolver Series, click here for details. 1. Post Phase Inverter Master Volume control (PPIMV). The PPI-Master Volume control attenuates the signal just before power amp section, eliminate much of the buzzy sounding overdrive found in other Master Volume designs. The PPI-Master Volume control is effectively bypassed when turned all the way up. 2. The Hi/Low B+ mode is equivalent to turning a VARIAC down from 120VAC to 85 VAC, but maintaining the correct heater voltages. The low B+ mode allows for a "tweed" or "brown" tone and provides a natural overdriven tone at approximately half the wattage. Other companies tend to utilize a Pentode/Triode switch to lower the wattage, which is often detrimental to tone. 3. NOS options. For those who prefer original components as compared to reissue, we offer NOS Phillips/Mullard Mustard capacitors and NOS or tested new Old Stock pre-amp and power amp tubes. 4. Wattage rating is approximate. 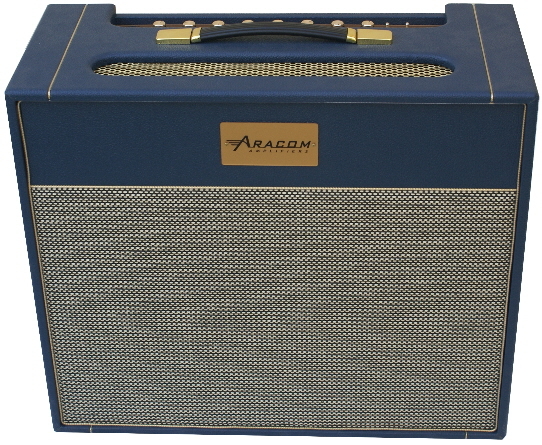 Custom 45R is a trademark of ARACOM Amplifiers.